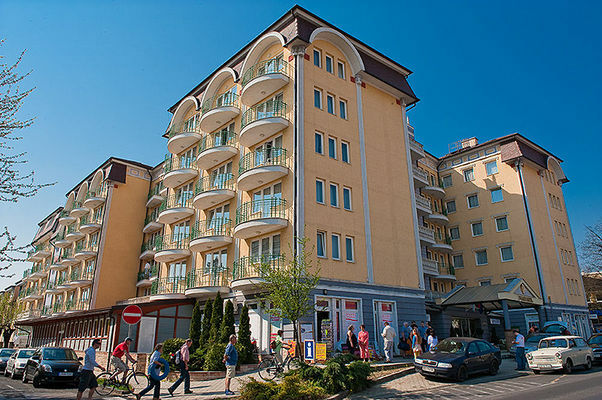 Nestled in the West Balaton Region in Hungary, just 6 kilometers from the town of Keszthely, Palace Hotel offers you a central location in the pedestrian street of the town within 200 meters from the Hévíz Thermal Lake. Our hotel offers 165 non-smoking, individually furnished, spacious double rooms and apartments mostly with balcony in elegant surroundings for guests seeking recreation and relaxation. The following facilities as standard in all guest rooms: adjustable airconditioning, TV with Hungarian and international channels, telephone, minibar, bathroom with walk in shower and bath amenities, bathrobe, hairdryer, sitting area, dining table. Most of the guest rooms are enhanced with balcony, safe and bidet. All guest rooms are decorated in relaxing geen tones. Double/Twin Rooms: 28 to 34 sqm of comfort. They will accomodate up to two adults and one child comfortably with extra bed. 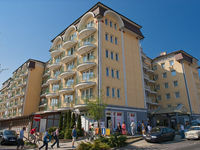 Apartments: feature separate sitting and sleeping areas with double bed. Suitable for up to three adults or two adults and two children comfortably with the pull-out sofa-bed. 39 to 42 sqm of comfort. The Monarchia Restaurant's menu brings together contemporary international and traditional local cuisine, partnered with a variety of great Hungarian wines. After an extensive buffet breakfast we serve set lunch menu and buffet style dinner daily. • Full board is available at 2800 HUF per person. • The hotel's own parking lot is available for the guests at 2100 HUF per car per day. • Pets are allowed for an extra charge of 3700 HUF per day. Most of the guest rooms are enhanced with balcony, safe and bidet. Most of the guest rooms are enhanced with balcony safe and bidet.